Lately, Natalie has really enjoyed perching on our knees when we sit with our legs crossed on the floor. 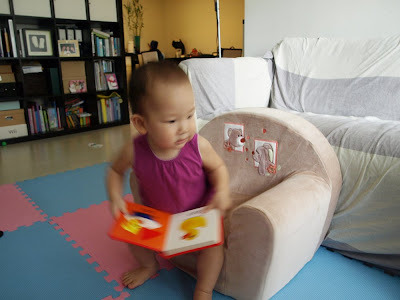 Our knees are the perfect height for her because she's not sitting on the floor and she can get up and sit down herself easily. Natalie seated on her new sofa with book in hand. She sits down and stands up and sits down and stands up. Hard to get a clear shot. 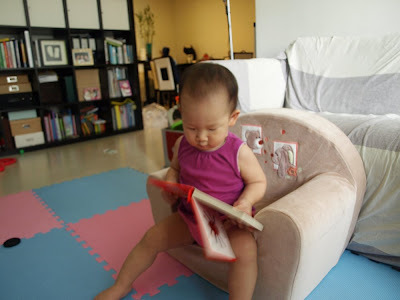 Here she is sitting down and reading. 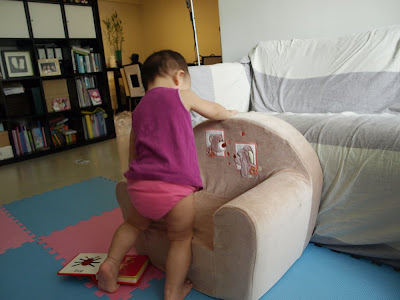 Then she abandons her book and examines her chair a little more closely. She tries to move it around (it's made of light styrofoam). And up! You can see how happy she is with her new sofa. it's cute!! i love it!! 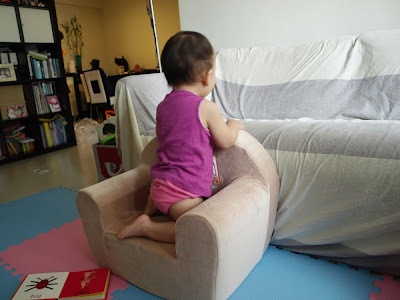 too bad there's no room in HK for more children's furniture! love it too.. so cute and it matches with your couch too! hopefully she'll put it to good use and read/watch tv on it!